.......Well, toilet's with a view then! There's no outside wall, just large pieces of glass providing you with an amazing view over Melbourne. They must be the most expensive toilets in the world! Hope people can't see in! I haven't taken a photo of this to show you so I don't spoil the surprise! There's no problem just entering the hotel and taking the lift up to the 35th floor as there's a bar and restaurant up there. You can do a day visit or a night visit when all the twinkling lights are on. Both are equally impressive. In fact, why not do both like I've done! 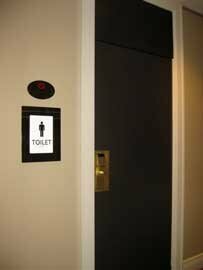 .......In fact my first visit to these toilet's came about because I visited the lobby area to see aboriginal paintings owned by a friend's relative who was exhibiting them. 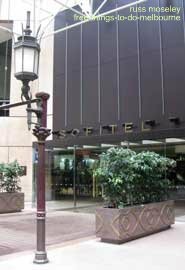 You'll find Sofitel located at 25 Collins Street, Melbourne, at what's known as the 'Paris' end of Collins Street. Just take the escalator up to the first floor and then the lift to the 35th floor. While you're in the area why not visit the Old Treasury Building which has the original Melbourne gold vaults and take a free tour around Parliament House. Both buildings are well worth a visit due to their history and architecture.